The intricately embroidered grid patterns used in Temperley London's Resort '19 collection are inspired by tire tracks - '30s motor driver Kay Petre is this season's muse. Created using black threads, the motif on this shirt is highlighted with sparkling sequins that catch the light so brilliantly. 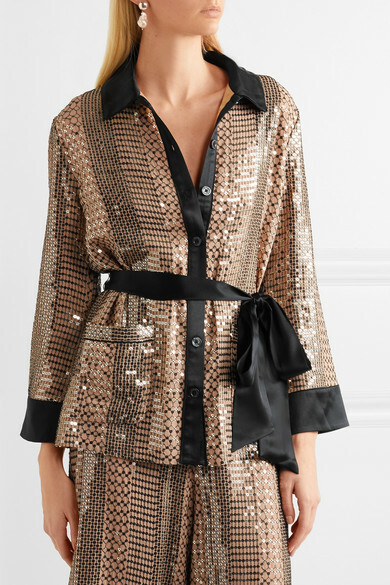 Tie the silk-satin belt in a bow at your waist. Outfit 1: Temperley London Pants, L'AFSHAR Tote, Prada Sandals, Sophie Buhai Earrings. Outfit 2: Haider Ackermann Pants, Carolina Santo Domingo Tote, Jimmy Choo Sandals.